This recipe for vegan Jewish honey cake is from Nava Atlas' "Vegan Holiday Kitchen" (Sterling Publishing Co., Inc., 2011). It is soy-free and can be made nut-free by eliminating the almonds. And, contrary to its name, it is made with agave nectar or pure maple syrup instead of honey. 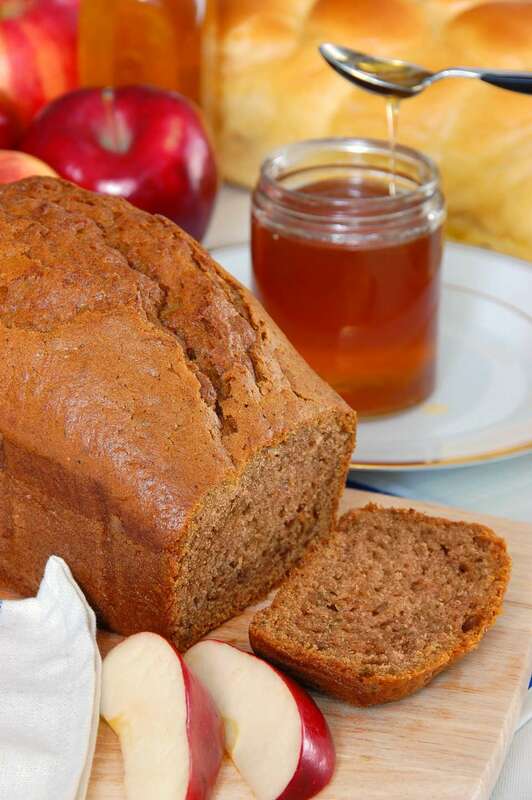 Atlas says, "Honey cake is a traditional dessert at Jewish celebrations, whether formal holidays or not, and is a fixture in the Ashkenazic Rosh Hashanah repertoire. In this recipe, dark agave nectar and maple syrup are combined to create a truly authentic flavor." Heat the oven to 325 degrees. Combine the first 6 (dry) ingredients in a mixing bowl. Make a well in the center of the dry ingredients and pour in the wet ingredients. Stir together until the wet and dry ingredients are thoroughly combined, then stir in the raisins. Cut two pieces of baking parchment to fit the bottoms of two 8-inch loaf pans. Lightly oil the sides. Divide the batter between the two lightly oiled loaf pans. Sprinkle the almonds (if using) evenly over the tops of the loaves. Allow the cakes to cool completely. Use a knife to go around the sides of the loaves to loosen, if needed, and carefully remove the loaves from the pans by tipping them into your hand, then set on a platter. Cut each loaf into 12 slices to serve.